Home Food & Drink Get A Free Bowl Of Matzoh Ball Ramen Soup With Every Drink Order This Thursday At Shalom Japan! 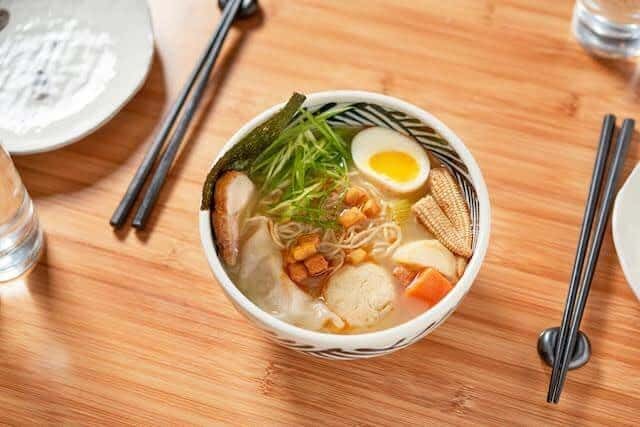 Get A Free Bowl Of Matzoh Ball Ramen Soup With Every Drink Order This Thursday At Shalom Japan! “That’s right, matzoh ball ramen soup is a thing where else but a Jewish & Japanese fusion restaurant in Williamsburg. The best part about this soup hybrid is that you can acquire it for free with any and every drink order at Shalom Japan during Thursday late night happy hours. At Shalom Japan, matzoh ball ramen – which is served with a soft boiled egg, chicken, scallions and mandels (almonds) – will run you $16 if you order it for brunch, and $18 if you order it for dinner, at which time it comes with foi gras dumplings (an extra matzoh ball will run you $2, the same price as an avocado during brunch and a dollar cheaper than an extra dumpling during dinner). If you visit the restaurant from 10pm to midnight on a Thursday, though, you can score one free bowl of it for free with every alcoholic drink order. That means if you order five drinks, you’re eligible for five free bowls of matzoh ball ramen. The general manager, however, says many struggle to finish even two servings of the hearty soup.